Frank Lloyd Wright is a renowned as a great architect. His city plans are less well-loved. In the 1930s he proposed Broadacre City, a new American landscape where everyone would have an acre of land, a car, and a gyrocopter. Fueling those cars requires gasoline. Gasoline requires Gas Stations. 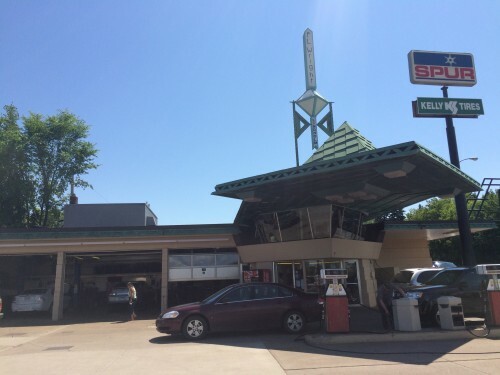 FLW, being an architect, had a gas station design. 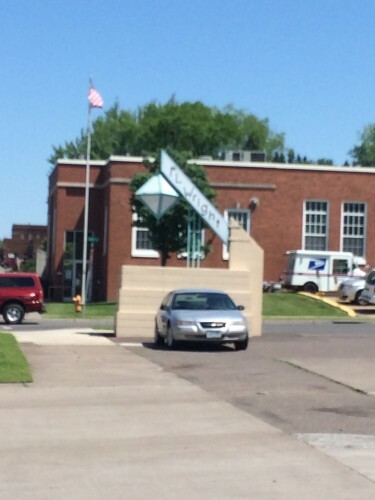 It was actually built in Cloquet, Minnesota (map). Needing fuel, and liking Wright, I took the opportunity to acquire some black gold at this classic design. Now a full-service Spur Station (on Main Street, but I can’t say much about the rest of the town, since we just passed through), it continues operation. 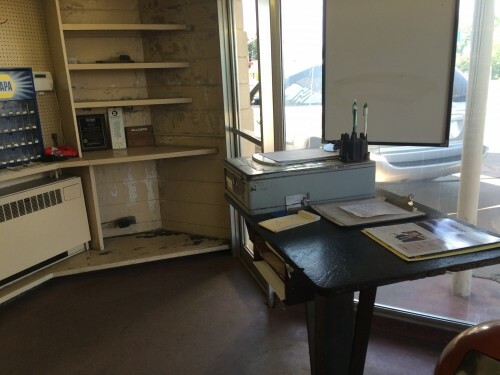 A history of the station is here. We didn’t exactly build Broadacre City (described in his book The Living City), though we didn’t exactly not build it either, aspects of it infuse post-War suburban America. But one element was exactly constructed. and remains attractive, as gas stations go, to this day. The dreams of what became the modern landscape evolved not simply from the minds of post-war developers, but had many pre-war antecedents, reflecting the agrarian/urban conflict dating back to at least Jefferson and Hamilton. Testable Prediction: Fleet Electrification and Autonomy, each with > 50% share of new vehicles by about 2030. … Smarter trucks, smarter roads and efficiency and financial gains from both were central themes of the panel’s discussion. Levinson said for the first time since the automobile began its 100-year boom in the early 20th century, miles traveled per capita has stagnated, with demographic changes (retiring baby boomers, for instance) and online commerce being two of the key drivers. Traffic congestion, however, may not be impacted, because total miles traveled in the U.S. is still on the rise due to population increases and other long-term trends. As the world’s relationship with the automobile changes, Levinson said, so does the potential for alternative fuels and electric-powered vehicles. That uptake will be later for trucks, he said, though he still sees electric trucks on the horizon. Similarly, Levinson said, around 2030 half of cars sold [ED: I think I said miles traveled] will be some form of autonomous. “Technology will drive regulators rather than the regulators driving technology,” he said. This paper presents new evidence about the role of bike share systems in travel behavior using a diffusion of innovation framework. We hypothesize that bike share systems have a contagion or spillover effect on (𝐻1) propensity to start using the system and (𝐻2) propensity to bicycle among the general population. We test the first hypothesis by modeling membership growth as a function of both system expansion and the existing membership base. We test the second hypothesis by using bike share activity levels near one’s home in a model of household-level bicycle participation and trip frequency. Our study shows mixed results. Bike share membership growth appears to be driven, in a small part, by a contagion effect of existing bike share members nearby. However, we did not identify a significant relationship between proximity to bike share and cycling participation or frequency among the general population. The findings hold implications for marketing, infrastructure investments, and future research about bike share innovation diffusion and spillover effects. Dorothy Cox at The Trucker wrote about my panel at the really interesting CVO Conference yesterday in Dallas “Industry must change, but tech advancements carry their own challenges, panelist says“. The conference can be followed on Twitter at the #CVOutlook hashtag . … And of course the conversation got around to autonomous trucks, the bywords of the day. But he painted a somewhat different picture than other speakers in discussing the subject. He said a driver might be engaged in supervising multiple drone trucks on set routes from a control center, intervening if something goes wrong, and told attendees that in the future, goods pickup and delivery could be bid on, leading to supply chain networking and consolidated home delivery. Where does that leave trucks? Pedestrian and bicyclist collision risk assessment offers a powerful and informative tool in urban planning applications, and can greatly serve to inform proper placement of improvements and treatment projects. However, sufficiently detailed data regarding pedestrian and bicycle activity are not readily available for many urban areas, and thus the activity levels and collision risk levels must be estimated. This study builds upon other current work by Murphy et al. 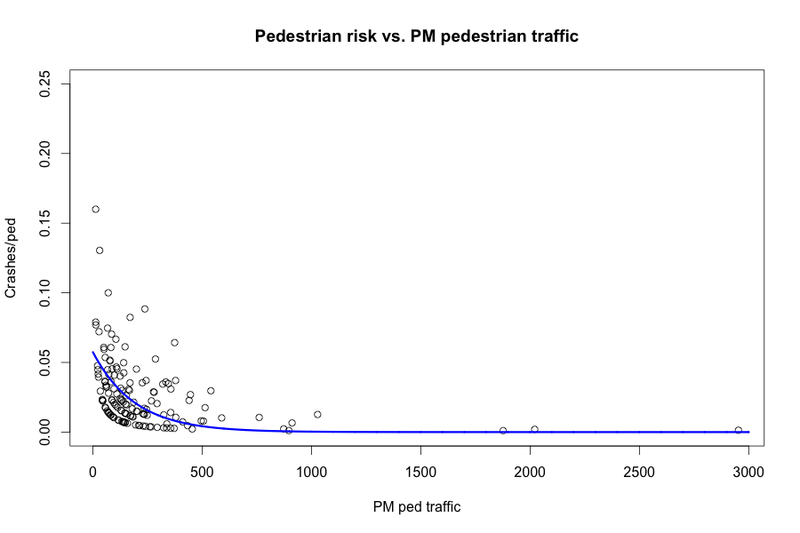 (1) regarding pedestrian and bicycle activity estimation based on centrality and accessibility metrics, and extends the analysis techniques to estimation of pedestrian collision risk. The Safety In Numbers phenomenon, which refers to the observable effect that pedestrians become safer when there are more pedestrians present in a given area, i.e. that the individual per-pedestrian risk of a collision decreases with additional pedestrians, is a readily observed phenomenon that has been studied previously. 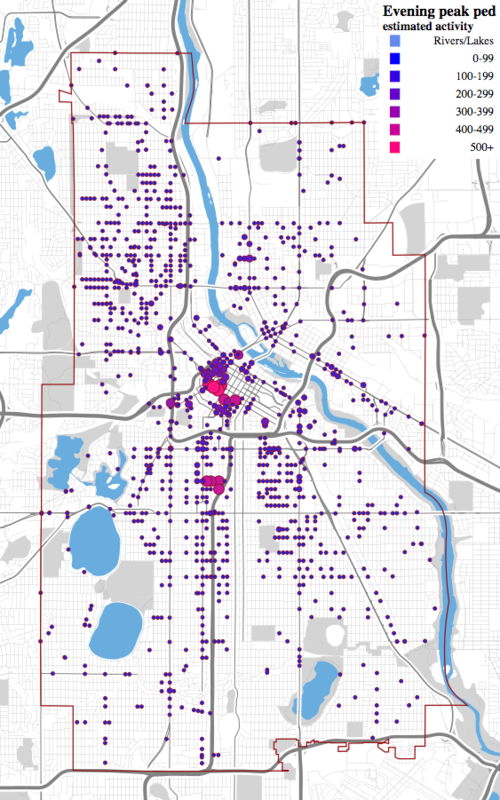 The effect is investigated and observed in acquired traffic data, as well as estimated data, in Minneapolis, Minnesota. 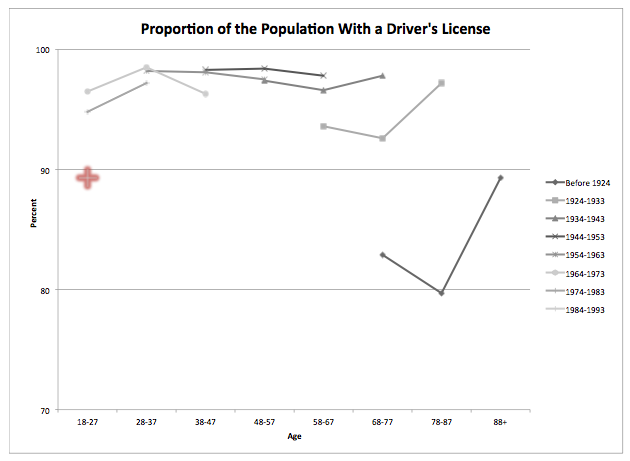 Proportion of population with a driver’s license by age and cohort (1990, 2000, 2010). Recent trends in the United States suggest a movement toward saturation of vehicle ownership. This paper examines this trend through an analysis of car ownership in the Minneapolis- St. Paul, Minnesota (USA) metropolitan region. Data from pooled cross-sectional household surveys are used to calibrate a model of car ownership that includes birth cohort effects to capture unobserved variations in preference toward car ownership across generations. Declines in household size and worker status have significant impacts in limiting the growth of car ownership, but they are also coupled by an apparent softening of preferences toward ownership among young adults. This study disentangles the impact of financial and physical dimensions of transit service operators on net transit accessibility for 46 of the 50 largest metropolitan areas in the United States. To investigate this interaction along with the production efficiency of transit agencies, two types of analysis are used: a set of linear and quadratic regressions and a data envelopment analysis. We find that vehicle revenue kilometers and operational expenses play a pivotal role in enhancing the accessibility to jobs by transit. The bivariate linear regression models indicate a 1% increase in operational expenses and vehicle revenue kilometers increase the number of jobs that can be reached within 30 minutes by 0.96 and 0.95%, respectively. 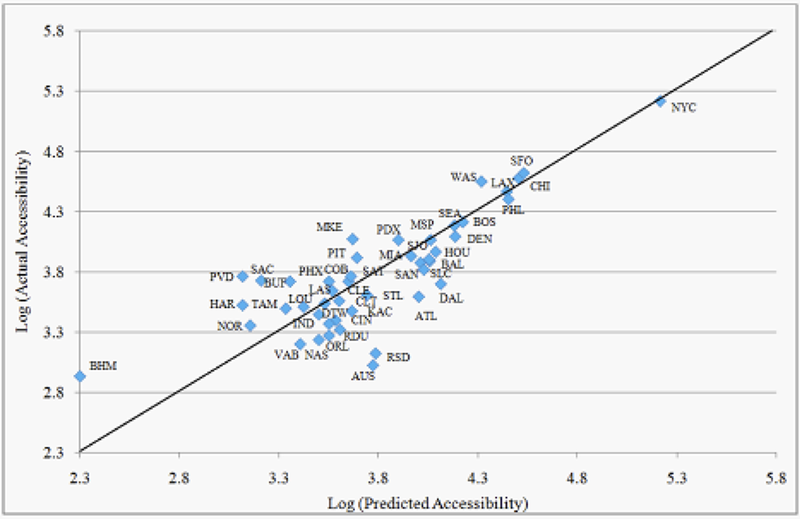 The results of the quadratic functional form, also, show transit services may have both increasing and decreasing accessibility returns to scale depending on system size, and the results are sensitive to the model used. Overall, the highest system efficiency (access produced per input) is found in the New York, Washington, and Milwaukee metropolitan areas, while Riverside, Detroit, and Austin perform with the lowest efficiency.